Description: The Nutrition and Mental Health (NUTRISAM) research group is an interdisciplinary team recognized by the Government of Catalonia as a consolidated group. It comprises researchers from the departments of Psychology and Preventive Medicine and Public Health at the Rovira i Virgili University. 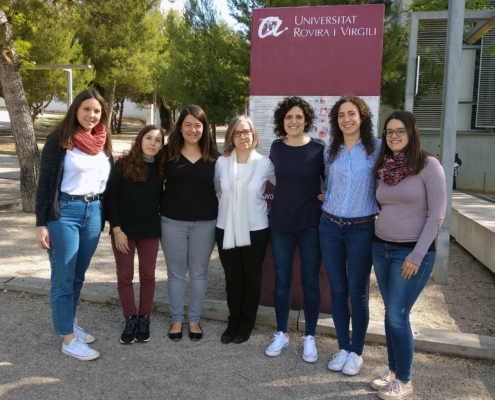 The members of the Psychology department (see photo) are lecturers Carmen Hernández, Paula Morales and Núria Voltas, as well as predoctoral research fellows. The group’s coordination is led jointly by Josefa Canals (Psychology) and Victoria Arija (Preventive Medicine). Epidemiology of the psychological problems that affect children and adolescents (school population assessed in academic centres). Evaluating the presence of different emotional disorders: anxiety, depressión and OCD; and evaluating the presence of neurodevelopmental disorders, mainly ADHD and ASD. Study of various risk factors: environmental, nutritional, genetic, sociodemographic, etc. Study of the presence of psychological problems, considering the influence of the prenatal cover and following the child longitudinally at different stages of development.